Nokia 6.1 Plus has a 5.8-inch Full-HD + (1080x2280 pixels) display. 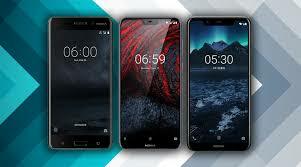 Nokia 5.1 Plus has a 5.86-inch Full-HD + (720 × 1520 pixels) 2.5 de Curved Glass Display. After using the phone for a while, we found that the viewing angle of the Nokia 6.1 Plus display is great, due to which you will be satisfied with it. However, the viewing angle of Nokia 5.1 Plus can frustrate you. After examining the detail in detail, we will give you a review of its flower. Both handsets open the first party application in less time and we have not had any problem with the camera app too. There was some problem while using Nokia 5.1 Plus because it crashed midway. The representative of HMD Global told that the phone is currently running on pre-production software. Inbound storage of Nokia 6.1 Plus will get 64 GB and 32 GB of storage in Nokia 5.1 Plus. It is possible to use MicroSD card in both smartphones if needed. There is a 3060 mAh battery in both the handsets. Both Nokia's smartphones support fast charging. The biggest feature of them is that both handsets are Android One smartphones. This will give you stock Android experience, and for two years Android version will continue to get security updates for up to three years. HMD Global has convinced that both smartphones will soon receive Android pie updates.